But there's still little appetite to talk about more restrictions. As of the final days of August, the United States has seen more than 200 mass shootings in 2015. The murder of WDBJ reporter Alison Parker and cameraman Adam Ward on Wednesday during an on-air broadcast brought the issue of guns back to the forefront of the political debate. Hours after the incident, 2016 presidential candidate Hillary Clinton tweeted her support for the immediate tightening of gun laws. Across the aisle, Republican contenders also expressed sympathy and grief, but dismissed the call for stricter gun legislation, citing other factors—mental health, poor law enforcement—as the causes of America's gun violence problem. One candidate asked, "What law in the world could have prevented him from killing them?" While it's certainly true that a number of factors contribute to the high rates of gun violence in the U.S., a comparison of state laws versus rates of shooting deaths does show a correlation. The states that impose the most restrictions on gun users also have the lowest rates of gun-related deaths, while states with fewer regulations typically have a much higher death rate from guns. The table that follows uses data on all gun-related deaths—homicides, suicides, and accidental deaths. The three lower charts show homicide numbers only. See the bottom of page for a record of updates to this story. See expanded table with all fifty states here. When it comes to self-defense laws in the U.S., there are two broad categories for states: "stand your ground," and "duty to retreat." In "duty to retreat" states, a person must attempt to flee from the dangerous situation before resorting to deadly force, unless they're already in their own home or private property. But in other states, "stand your ground" laws offer complete immunity from prosecution for the person defending him or herself with deadly force, whether the encounter occurs in that person's home, or in a public setting. 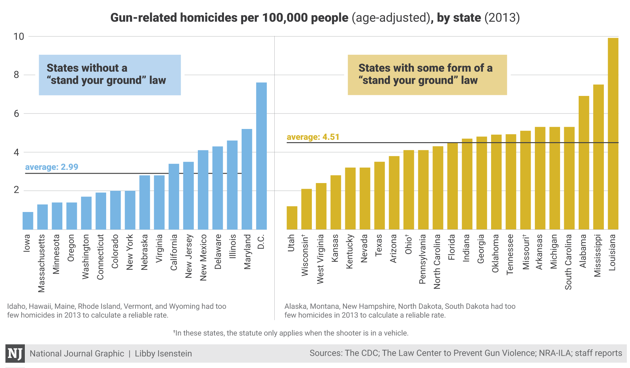 Among states that do not have any kind of "stand your ground" law, the average rate of gun homicides in 2013 was 1.52 lower (per 100,000 people) than in states that do have such laws. Federal law requires background checks on all commercial gun sales. However, this excludes any transaction from an unlicensed seller, such as a sale at a gun show or online. An estimated 40 percent of gun sales in the country are made via unlicensed sellers. In an attempt to close this loophole, certain states have laws subjecting all gun sales, regardless of vendor type, to background checks. 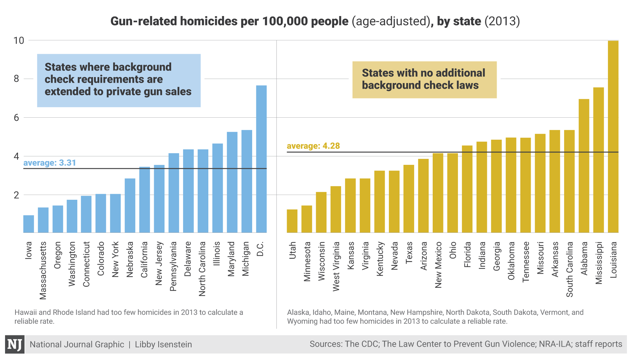 Among the states that impose extra background check requirements for private gun sales, the average gun homicide rate in 2013 (per 100,000 people) was 0.97 lower than in states that do not regulate background checks beyond the federal requirements. In regulating the right to carry a concealed weapon, states generally fall into one of two camps: "may issue" and "shall issue." In the "may issue" states, law enforcement agencies are granted discretion in determining who receives a permit. In the "shall issue" states, law enforcement has little to no discretion, and is obligated to issue a permit to just about any applicant that meets basic requirements. Four states do not require a permit to carry a concealed firearm. 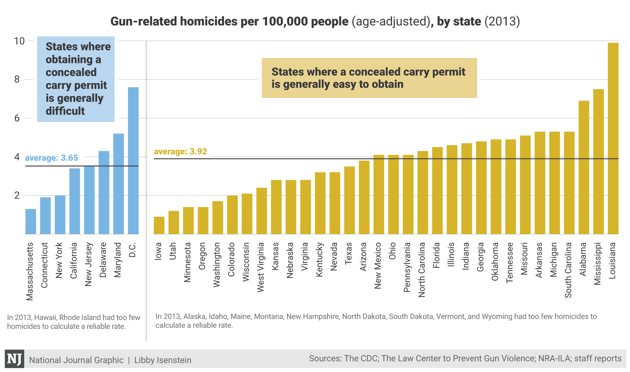 Among the "may issue" states, the average rate of gun homicides in 2013 was only slightly lower than the rate among "shall issue" states, and states that do not require a permit to carry a concealed weapon. Note (8/31/2015): We've updated the three lower charts to display only gun-related homicides. The top table uses data on all gun-related deaths—homicides, suicides, accidental deaths. Note (10/5/2015): The lower three charts and several averages cited in this story have been updated to use age-adjusted homicide rates rather than crude rates. Age adjusting rates is a way to make fairer comparisons between areas with different population compositions. The top table has been updated to exclude legal interventions involving firearms. 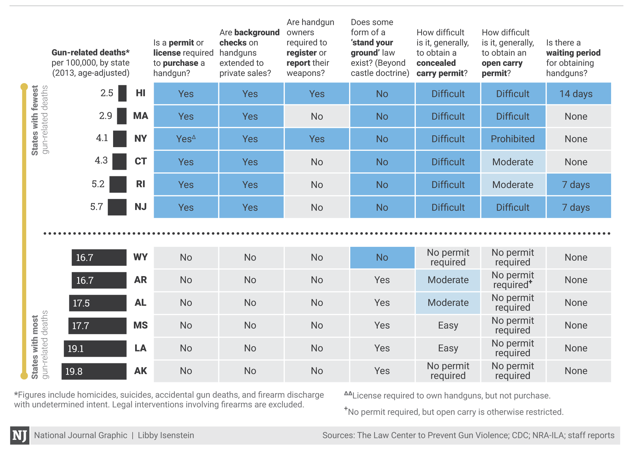 Note (10/19/2015): The top table has been updated to clarify states' positions and update certain state laws based on the latest information provided by the Law Center to Prevent Gun Violence. The breakout analysis charts below have been updated accordingly. Note (12/3/2015): Open carry laws for Arkansas and North Dakota have been updated.